Mental focus is the most important skill when it comes to success in any area of your life. Being able to focus will also improve your confidence because you'll be able to start achieving those goals you set for yourself. Often your confidence can be diminished simply because you find yourself procrastinating and unable to concentrate long enough to work on your goals. You end up watching tv instead of working on that project that really does mean a lot to you because you just seem unable to focus. You can end up feeling guilty, confused, and wonder if you're just lazy when it all really comes down to being able to focus. So, what does focus really mean? 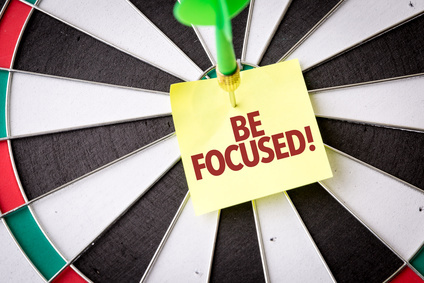 To focus means to concentrate on a particular task or problem for a period of time. That's it. Sounds simple enough, doesn't it? The good news is that it's something you can get better at with practice. 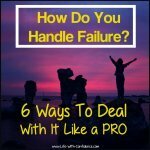 So, if you're feeling frustrated right now and wonder why everyone else seems to be able to do it and you can't, remember, it's a skill you can learn. It's also important to know that being a chronic multi-tasker who jumps from one task to another and never seems to get anything done is also a skill you've taught yourself. It's just not a beneficial skill when you're trying to focus. Anyway, let’s look at exactly why mental focus is crucial for success and how it can help you get things done. Knowing the benefits of being able to focus can be what motivates you to actually figure out why you can't focus and how to turn things around for yourself. Distractions are all around us. You sit down at your desk and end up checking email, browsing through Facebook, or getting lost on YouTube watching video after video. We get distracted by new projects, things that need taken care of around the house or the office, and of course by family members and coworkers. With all these distractions it’s a wonder we get anything done. There’s always something else that demands our attention, or a fun new project we’d rather be working on. 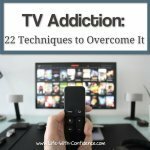 The problem with too many distractions is that it can lead to a sense of complete overwhelm and you can end up shutting yourself down as a way to cope with those emotions. You end up watching tv instead of working on something you need to do because there's just too much sensory overload. This is where focus can make a huge difference and help you get things done. You make the decision to block out everything that's not important for the task at hand. Focus is like a pair of blinders. It helps you concentrate on your project until it's done. Being able to focus on one thing is often the key to actually being able achieve a goal. As Jessica Abel says in her article, "One Goal To Rule Them All", too many projects = no projects. Or as Steve Jobs said in 1997 in this short 3 minute video, "Focus is about saying No. And the result of that focus is going to be some really great products". Being able to eliminate distractions will also help you to be creative. As John Cleese explains in his video, John Cleese on Creativity, "One of the most dangerous things when I was trying to write anything was to be interrupted. Because the flow of thought I had was not immediately picked up after I had the interruption... The key to getting into a creative state is to avoid interruptions." Another really great piece of advice he provides in his video is that you need to set up boundaries of space (don't let others interrupt you) and boundaries of time (set up a start and end time but also allow yourself enough time to allow your creative brain to start working. You can't get to the great stuff if you're only allowing yourself 10 minutes to work on something.). 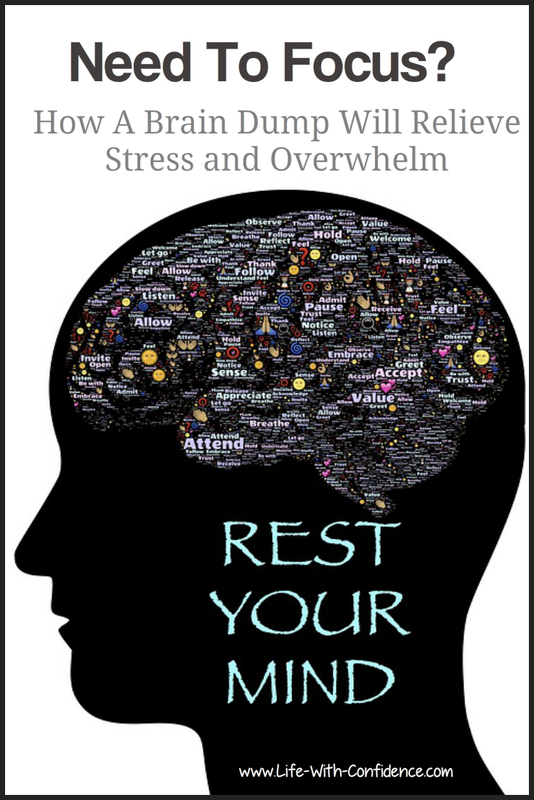 If you still need another reason as to why saying No to distractions is so important, be sure to read this inspirational article written back in 2012 by Mark Milke called, "Turn Off The White Noise To Fully Experience Life". As he says in the article, "If you want a better, more rewarding existence, you have to say 'no' more often than 'yes'.....An advantage exists for those who choose the better over the banal. Those who can shut up and shut out the unhelpful distractions long enough to let the useful thoughts and activities into their soul can then accomplish something valuable. While counter-intuitive, the world will never belong to those who engage every distraction. The world will not build future shrines to those who email, Facebook, text, twitter and talk their lives away but never had anything useful to say in all their virtual activities; they never took the time to ignore the frenetic present long enough to learn from the past or from some still small voice." 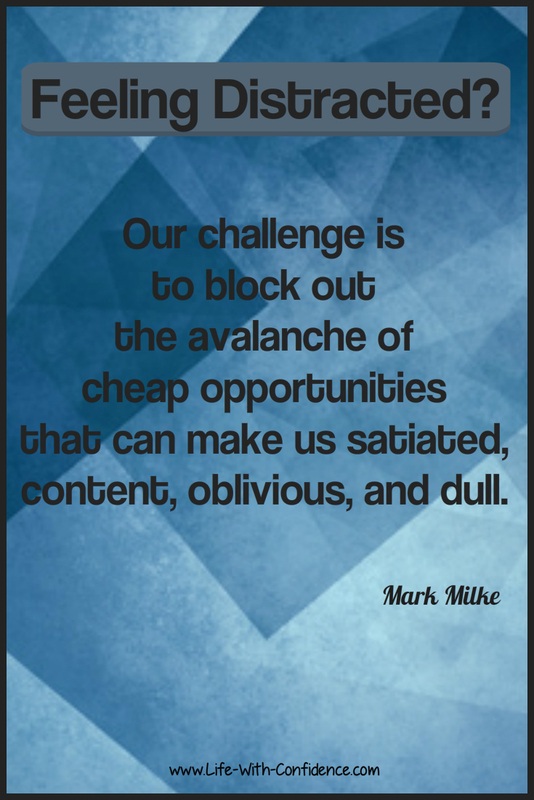 His final sentence is, "In 2012, our challenge is to block out the avalanche of cheap opportunities that can make us satiated, content, oblivious, and dull." Something to print out and post above your computer as a reminder the next time you think you'll just take a second to read your Facebook page. It's such a great reminder why you shouldn't ever waste your time surfing mindlessly. Okay, so now that you're convinced as to why you need to avoid distractions when you're trying to focus, let's look at a couple of other reasons why it's important to focus. When you're not constantly distracted and you’re able to give your full attention to whatever it is you're working on at the moment, you’re far less likely to make mistakes. Mistakes happen when your attention is divided and you’re not fully engaged and immersed in the task you're working on. Being focused, on the other hand, helps you concentrate on your work. It allows you to make less mistakes to begin with and when you do make them, if you’re not distracted, you’re that much more likely to catch them and fix them. The end result is a better quality product, no matter what you’re working on. Everyone wants to get everything done faster. We live in a faster and faster world and we want everything done now. So, instead of trying to do ten things at once thinking that means you'll get more done, try focusing on one at a time and be amazed at how much faster things get done. Here's an example. Have you ever worked on a tight deadline? Let’s say you have to finish a report or finish filling out an application form before you can head out to lunch to meet a friend. If you’re highly focused (thanks to that looming deadline), a task that would usually take you half a day is suddenly accomplished in 30 minutes. Best of all, the end result is often better than your usual work because you’re highly focused and are getting into the flow where everything just comes together almost effortlessly. As John Cleese said in the above video, you're more creative when you're focused. When you allow yourself to go check your email or your Facebook account even if it is "just for a second", you've now lost your concentration and when you go back to your task, you'll have to waste time remembering where you were and trying to remember what you needed to do. You've lost your train of thought and it wastes valuable time trying to regain it. It also wastes your brain energy in trying to get back into the project. You only have so much brain energy to use in a day. It's silly to waste it trying to re-focus yourself when if you'd just remained focused instead of allowing yourself to be distracted, you'd probably already be done the task. So you should now be convinced as to why being able to focus is so critical for your confidence and your ability to be successful. Making the effort to develop your ability to focus is definitely worth your time. 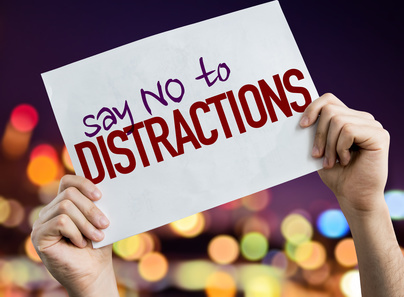 In this series on focus, we're going to look deeper into understanding distractions and why they're so hard to resist but also at some hidden reasons why you may have difficulty focusing. For example, procrastinating and being unable to focus may really be due to underlying anxiety you have towards the task. That's the type of thing we're going to be looking at in upcoming articles. But, first, let's look at your priorities. Do You Know What Your Life Priorities Are? You might be surprised. 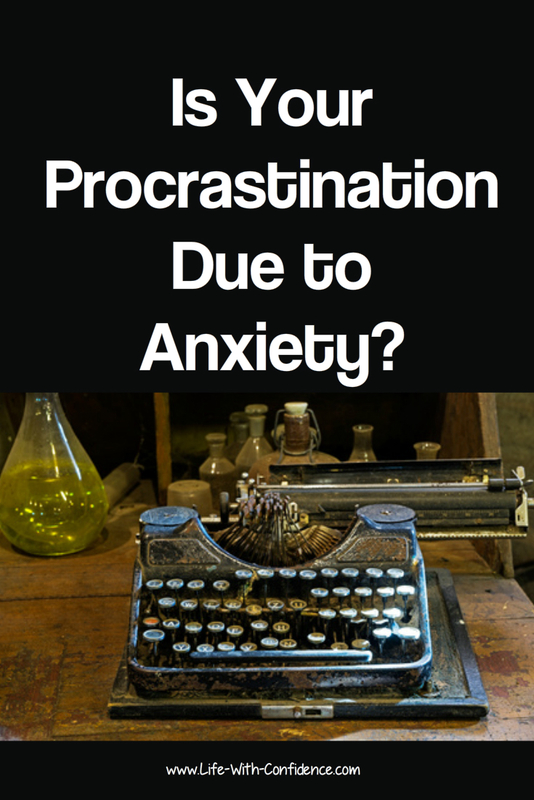 Is procrastination a problem for you? 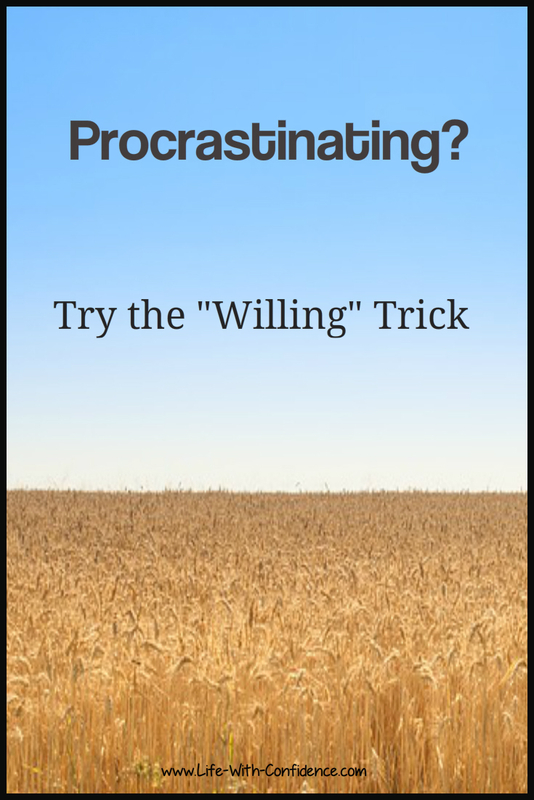 Try the willing trick.